Intex Automatic Pool Vacuum Take the work out of cleaning your swimming pool this season with the Intex Pool Vacuum. 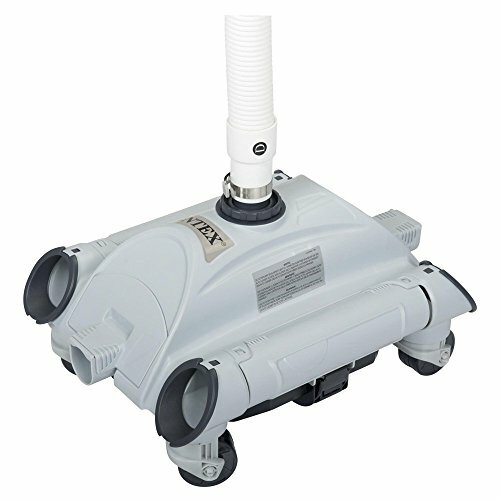 Connect this automatic pool vacuum to your existing filter pump (1,600 - 4,000 GPH) and this little workhorse does the rest. Using venturi suction, this automatic pool vacuum will keep the bottom of your pool clear of leaves and other debris. Spend less time cleaning your pool and more time enjoying it with the Intex Pool Vacuum! Troubleshooting stepsMake sure the filter pump is turned off, and disconnect the power cord from the electrical outlet. 2. Using the Set Up instructions in reverse, disassemble the auto cleaner. 3. Clean and air dry all the accessories and parts thoroughly. 4. Keep the hoses straight during storage. 5. Remove the brushes and keep them flat and straight during storage. Cleans your pool without effort!